Michigan Governor’s Office replies, but declines to take action. Home / Blog / Michigan Governor’s Office replies, but declines to take action. We received a response from the offices of Governor Rick Snyder, in Michigan, regarding our campaign asking them to take action over the dog-meat trade in Gyeonggi Province in South Korea, who they have business-related agreements with. 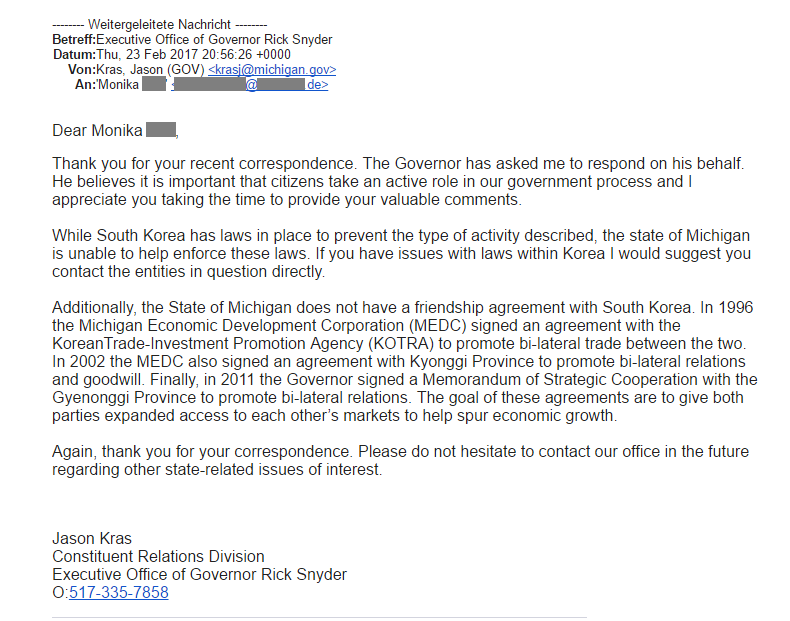 And, whilst we are grateful for a response from Governor Snyder’s Office (on so many occasions we fail to get any sort of response from the many people and offices contacted across the globe), we are disappointed to hear that all they advise is for us to contact ‘the entities in question directly’ in South Korea. The Governor’s representative also states that Michigan does not have a friendship agreement with South Korea, only various agreements for the benefit of economic growth etc., from which we infer that they feel unable to address the dog-meat issue with their counterparts. We feel that they could have taken simple action, like many Mayors have done, but they declined to do so and have chosen to look the other way, putting their economic interests first and ignoring the immense suffering and terrible injustice inflicted on these animals. I have zero respect for Rick Snyder, fine with dog torture Governor Rick Snyder. A fine example of showing `spine´ … far easier to duck out – a politician, what else. Agreements ARE part of sister city’s arrangements, and this Mayor looks particularly ridiculous using semantics to really say he does not want to help the horrendous suffering of the Korean dogs in his sister city in South Korea. Shame on your Governor Snyder!….I hope you can see your harshness is putting your economic interests in a nation that tortures dogs and cats behind the economic interests of Michigan!…..you are a first world country, and can do more than this tiny response via your representative!…Appalling. Regardless whether the Governor has direct relations or not, it would not have hurt just to write to Sth Korea expressing the views of the people and making comments about their inhumane practice. Sure the dog owners in Michigan don’t share your indiffrence to animal torture. And you couldn’t even be bothered to reply personally. Lets pray that you are replaced asap by someone worthwhile. This torture of innocent angels is disgusting and shameful and anyone who can turn their head away from such a horrific practice must be evil! This has to stop!!! Everyone should contact the White House and expose this right away so the public understands that what they are doing is illegal and immoral! You are just a waste of skin rick Snyder. How can you possiblaly turn away from this horrendous cruelity to these poor innocent dogs and cats. You have no soul nor heart like the basters that are doing this. All you worry about is economic growth etc! ?You don’t have the balls to even try decussing this dog meat issue in fear of losing the economic growth. Karma is knocking on your door. An eye for an eye! !